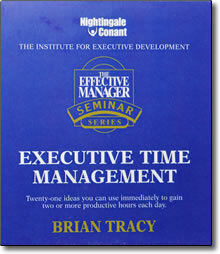 Executive Time Management DVD by Brian Tracy – Discount! 21 ideas you can use immediately to gain two or more productive hours each day. The ability to get tasks done quickly is considered the top trait executives and managers look for in promoting employees to upper levels of management. You owe it to yourself to arm yourself with Executive Time Management skills. By prioritizing, your tasks you will become a more effective and productive manager.